To start the sauce, finely mince the shallots. With the pan on medium heat, melt the butter and then briefly sweat the shallots. Next add the white wine and let reduce. Once only a few tablespoons of the liquid remains, the cream can be added. Whisk the sauce and bring to a gentle simmer. Let the cream reduce by at least half, which should take about 10 to 15 minutes. Once done, the sauce should be thick enough to coat the back of a spoon. To finish the sauce, add the Dijon mustard and taste for seasoning. This sauce is a good base for many other sauces. Try adding fresh tarragon or basil and serve it with chicken, fish or even pasta. Get creative with it and add your own touch. Dijon cream sauce can be prepared in advance and kept warm in a baine marie. This sauce is also nice with delicate herbs such as fresh tarragon or chives. You could even add things like fresh pesto or sauteed mushrooms and turn it into a completely different sauce. This versatile cream sauce goes well with chicken, pork, fish and even pasta. If a skin does form, can it be stirred back into the warm sauce and be reincorporated? The skin should dissolve. Simply whisk it back in. If it doesn't fully dissolve, pour the sauce through a strainer before serving. Hi Joe, is there a way to make this ahead of time? Sure... in professional kitchens it is often made ahead of time and even re-heated the next day for service. There are some important things (food safety wise) to keep in mind when cooling and reheating any food. To cool, place the sauce in an ice bath, stir occasionally until cooled and then cover with plastic wrap and place in the refridgerator (when cool - NOT hot). It's a good idea to not fully reduce the sauce though as this can be done when reheating (just keep it a little runnier than desired - then cool). When reheating, do so on a medium-low to medium heat as the cream will be very thick and can burn easily. Stir occasionally until it starts to warm up and be sure to bring it to a quick simmer (bubbling) stirring constantly. Lastly, keep simmering (reducing) until you reach the desired consistency. can be sauce for meat or much good for the fish? This sauce can be used or adapted for fish, meat, chicken or pork. Since there are only 3 tablespoons to start with, should that read teaspoons? Thanks for the catch. The recipe has been updated. The wine should be reduced to about 1 tablespoon (or at least by half). You might be interested in checking out the Cooking School Lesson on How to Make Pan Sauce. Also, just fyi, 1/4 cup is the equivalent to 4 tablespoons. Happy cooking! For my cream sauce I left the mustard out, and added sauteed baby bella mushrooms and some Italian cheeses. It was the first time I had ever tried a cream sauce and it turned out delicious. The only thing I did not like was that it left me with a 'milky' aftertaste, this slimy feeling in my mouth long after dinner, which I usually get after drinking milk. There must be something in the ingredients that I used or my cooking technique, because I never get this when I order cream sauce in restaurants. I used heavy whipping cream, and I am wondering how I can make this sauce less 'milk-like'. Should I use something else (like half-and-half or even regular milk thickened with a roux or a slurry) or can I make it less 'milk-heavy' by cooking technique? Should I have reduced it more, or less? Is there some technique to cook the 'milkiness' out of cream, like how you cook the 'flouriness' out of a roux? It's hard to say without having tasted it. This is a cream sauce. Perhaps the type of cheese you added is what made it "slimy" or maybe you over-reduced the sauce and made it too thick. I would not try substituting half and half as it won't thicken in the way that cream does and has a higher tendency to split. Try it again without the cheese, being careful not to over-reduce it. Thin it down with a touch of water if it happens again. Cheers! Thanks for the feedback Kimberley, I will definately try without the cheese next time (although it added a lot of flavor, and cheese does not normally give me that slimy feeling in my mouth). Would adding some lemon juice cut through the creaminess? If so, how much should I add? I know I could try this myself, but it'll be a while before we have cream sauce again :). You can try adding some lemon juice to taste. In terms of how much to use, you'll just have to keep adding bit by bit and tasting it until it suits your tastes. Trust yourself and what you like. The lemon juice may cut through some of this milkiness you are experiencing, but I have a feeling that you over-reduced the cream and, that's ok...experiences like these will help you learn. Good luck next time! After being sent to heaven by a butter sauce, I just had to try a cream sauce. My recipe was influenced by a quick google search at work. I used: 1/2 cup diced yellow onion 1/4 cup white wine 1/4 cup beef stock,store bought,zero fat, zero gelatin :-( 1/4 cup cream 1 cup sliced white mushrooms 1 tbsp Dijon mustard 4 tbsp butter (as a quick fix disaster recovery) salt and pepper to taste I pan fried tenderloin beef strips in oil before frying the onions and the mushrooms, then deglazed the pan with the wine, reducing by half, then added the cream and stock and let that reduce by half... but the consistency was much too thin and the sauce was getting a bit on the too little side - all curdled and uggly... so I remembered how butter emulsified with the wine in the butter sauce lesson and took a gamble at whisking in 4 tablespoons of butter and what do you know - a creamy consistency set in and the sauce started looking good. Now for my question: can anyone here explain to me just why exactly the butter saved my dish and my day? In another lesson on this site we're taught how egg yolk can be used to help balsamic and oil play nice and form a stable emulsion, but just what is going on under the hood? In the herbs lesson rouxbe pays particular attention at explanation via classification and that really helps people with my frame of mind: having a classification system offers many mental hooks to tie relationships between objects of a subject and that's a tremendous aid in truly understanding any topic. Sorry for ranting so much on this - but this site has already transformed me from a take-out mongrel to somewhat of an okay cook and all I want is more and more and more of this. Please help? Butter can be a good thickener for water-based or thin sauces. 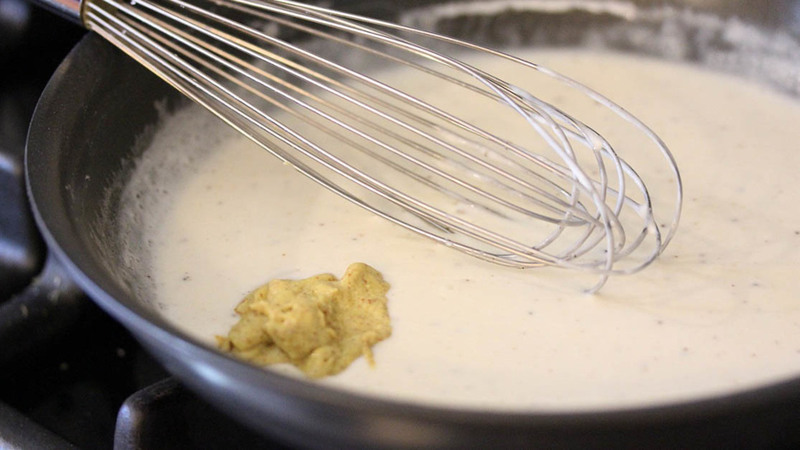 By whisking in cold butter at the end of cooking, the emulsion will produce a consistency of light cream (depending on how much is added). You might find it useful to watch the lesson on Pan Sauces. Sounds like you enjoy the science behind cooking. One great resource you might want to read is On Food and Cooking by Harold McGee. Cheers! Thanks Dawn. Indeed, like many patrons of this site I'm blessed and cursed with an analytical mind. I feel helpless on any subject until I have that deeper understanding on the fundamentals. Thanks for the book title. Another I'm thinking of purchasing is "The Flavor Thesaurus" by Niki Segnit - apparently the author elaborates on flavor parings and tries to teach by using another classification system: the flavor wheel. Do you know this book? And of course the "What Einstein told his cook" series also seems like a winner on the topic of the fundamentals and the processes behind cooking. Books are good to have but takes allot of time to read - I have to say that this site is the perfect compliment to the vast sea of information out there. It really helps to see things happening right in front of your eyes. I do not have these books but as you said there are so many out there. Most important though is getting in the kitchen and cooking. To keep this thread specific to Dijon Cream Sauce, I will direct you to another thread on the subject of books about cooking. Cheers! In the lesson it says to cover the sauce with plastic wrap if holding in a bain marie so that a skin does not form. I just want to make sure I'm understanding the video correctly, the plastic covers the top of the container and does not sit on the surface off the sauce? The plastic wrap is generally placed directly onto the surface of the sauce to prevent a skin from forming. Cheers! Joe, that's what I thought, the plastic should be placed directly on the sauce surface. But I watched the video again, it sure looks to me like they're placing it on the top of the container and not on the sauce.